Would you like to learn how to build engines like a pro but can't afford to go to an automotive trade school such as Wyo-Tech, UTI (Universal Technical Institute), or SAM (School of Automotive Machinists) because they're either too expensive or too far away? There IS an alternative with Auto Shop Videos! Now you can bring the auto shop class right into your own home! (Click image to enlarge). These also make fantastic primer tools to get that holeshot over everyone else in the class if you decide to go ahead and go to one of those schools. 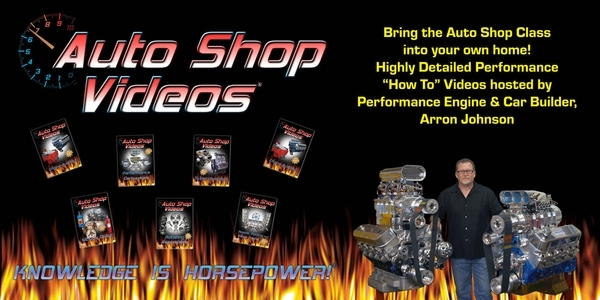 Watch the short video below to see what Auto Shop Videos are all about! Auto Shop Videos are so detailed and so well done, they are the ONLY automotive how-to videos sold in major automotive outlets such as Summit Racing Equipment, Jeg's, Speedway Motors, Competition Products and many, MANY others, or directly from this web site by clicking HERE. They are highly praised by automotive industry icons, such as Jay Leno, Vic Edelbrock, Mike Thermos (the founder of NOS) and many others, plus have been featured on TV shows such as PowerBlock TV, Jay Leno's Garage, Inside Drag Racing, Rods and Rides TV and several others. To see what industry icons have to say about them, click the "Get The Scoop" banner to the right, or click HERE. These are all multi DVD sets ranging from 3 hours in length to almost 13 hours! They're packed with the REAL detail and information you want, (and need), to know in order to learn how to build your own engine and get your vehicle out performing others. Knowledgeable, effective personal training in auto shop skills can be expensive and hard to find. There is simply no better way to learn these skills than to be shown and told what's what, how it all works together, and what to do to make it work for you.